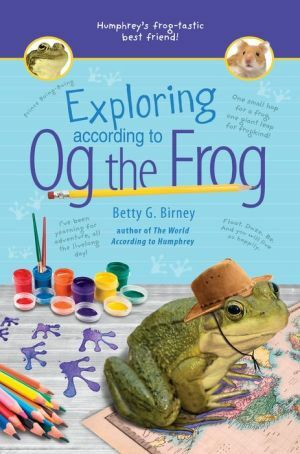 In the second book in the Og the Frog spinoff of the Humphrey series, Og is ready for adventure and is jumping at the chance to help kids be brave! Og loves the kids in Room 26, but he's awfully curious about the human world outside his tank! His friend Humphrey has no problem getting out and about, but it's harder for Og because he can't climb the way a hamster can. But Og never let hard work or fear stop him from going after what he wants. And he's determined to help the tads in Room 26 understand that taking risks can pay off--especially when they are being true to themselves. Whether it's learning that a younger kid can have great ideas, a student who learns differently can have hidden talents, or ideas that seem crazy at first can actually be amazing if you look at them from a different perspective, Og wants everyone to celebrate their talents. And once he fully embraces his frogginess--BING-BANG-BOING--he figures out how to go where no frog has gone before. Og's frog's-eye view of the world is curious, adventurous, and creative, and the perfect companion to Trouble According to Humphrey.